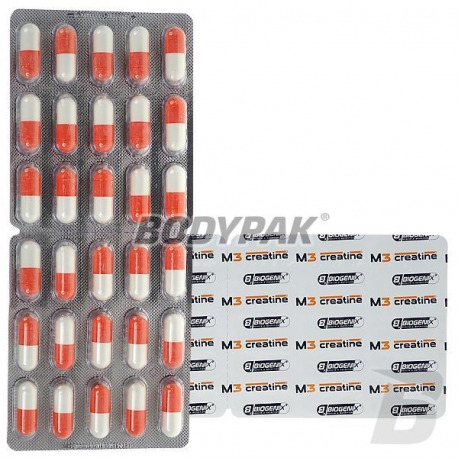 CreatineBiogenix M3 Creatine Monster Caps - 30 kaps. Biogenix M3 Creatine Monster Caps - 30 kaps. High quality product with a strong anabolic effect! 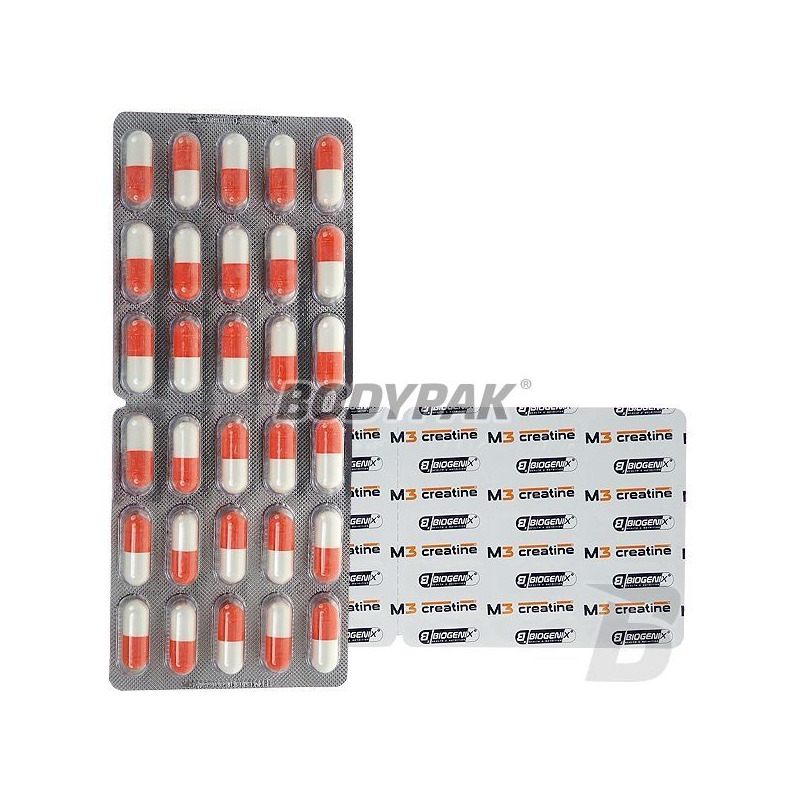 Contains creatine malate - Tricreatine malate used as a means of increasing the effort capacity, facilitate the development of strength and muscle mass! Because creatine is one of the best legal means of anabolic and ergogenic, however, relative to muscle penetrates quite weak for some time is working on obtaining forms of creatine, better zagospodarowywanych by muscle tissue. When conducting similar work should not flee researchers important fact that the improvement in absorbability of creatine is only half the battle. We must remember that creatine is only a precursor of the active anabolic and ergogenic phosphocreatine. Thus, the increase in the level of creatine in muscle cells, although important, is not as important for the development of functional capacity and muscle mass, as the rate of synthesis and the level of phosphocreatine. There are also modern science focuses on the search for forms of creatine, not only better distributed to the muscle tissue, but also more effective in stimulating synthesis of phosphocreatine. Extremely fruitful result of this search was malate -TRICREATINE MALATE- molecule - coupling molecule creatine malate molecule. Malate keratin much more soluble in water than the monohydrate, and the solubility is essential for the absorption, because the body can be downloaded from the gastrointestinal tract, only that which remains in a dissolved state. The molecules of the malate salt are from the chemical group of hydroxy carboxylic acids that have the ability to stimulate insulin - a hormone responsible for creatine transport into the muscle metabolism of rest. At the same time, malate belongs to the metabolites glucose - factors - facilitating the collection of creatine by muscle cells in the metabolism of stress and post-exercise. From the combustion of one mole of glucose can acquire body 38 molecules of adenosine triphosphate ATP, capable of synthesising creatine same number of molecules of active anabolic and ergogenic phosphocreatine. Of these, 38 molecules of up to 36 (approx. 83%) is obtained as a result of the activity of malate molecules. Out of this amount, 30 formed at the same time co-pyruvate, and 24 - with the participation of citrate ... These figures best illustrate the superiority of creatine malate over others, though also extremely valuable, conjugated forms - citrate and creatine pyruvate. Malate is at present a form of creatine, the most readily absorbed and most stimulating the synthesis of active anabolic and ergogenic phosphocreatine, perfectly suited for creatine supplementation both during the resting metabolic rate, as well as exercise-induced !!! Malate M3 Creatine is designed for physically active people and professional athletes as an agent to increase the ability of stress and facilitate the development of strength and muscle mass. Each capsule BIOGENIX M3 Creatine provides 1050mg of the highest quality creatine malate-Tricreatine malate. 2 caps. Before and after training. Cenowo faktycznie może wyjść średnio.. zależy do czego porównać. W mojej ocenie jest to niezły produkt o dobrym działaniu. If you dream of athletic figure and muscles hard as steel - just select the product, and will not be disappointed! The only thing you have to remember is training, diet and regeneration - nothing more. Muscles are built using this incredibly powerful creatine!